Mayor Miro Weinberger, left, and Fire Chief Seth Lasker announce a paramedicine program at Station One. 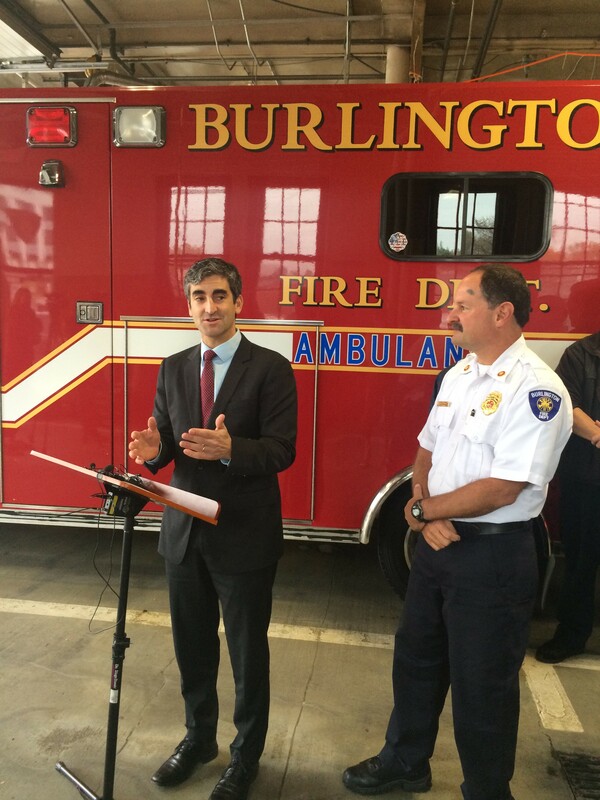 Burlington's Fire Department will start dispatching paramedics to all medical emergency calls, Mayor Miro Weinberger announced Wednesday. Struggling to be heard over wailing sirens at the city's downtown fire station, the mayor said the program will provide "better to care to Burlingtonians" at a "very modest cost." Paramedics have more training than EMTs — 1,600 hours are required, compared with 300 hours for advanced EMTs — and can administer roughly 20 medications that EMTs cannot. The Burlington Fire Department already has five paramedics on staff, and a sixth is close to getting certified; it plans to train three additional people at a cost of $3,200 per paramedic. At the press conference, Weinberger was flanked by outgoing Fire Chief Seth Lasker and Dr. Michael Sheeser, an emergency room physician at the University of Vermont Medical Center. Sheeser, whom the mayor described as a "forceful voice" in advocating for the change, noted that the role of paramedics has been the subject of much discussion in medical circles. "A lot has been made in recent years about the actual value of paramedicine," he said. The physician also acknowledged that in the case of Burlington, which has a hospital located minutes away, people might question the need for higher level "pre-hospital care." But, he argued, "It's important to recognize that most calls are not four minutes or two minutes... these things can take a long time." Sheeser continued, "Imagine you're that person who has a broken femur or a collapsed lung or who has a horrible kidney stone 15 minutes away. You're the one who's going to want a paramedic on that ambulance taking care of your pain, taking care of your vomiting and doing the things that cannot be serviced by any other provider, including advanced EMTs." The Weinberger administration is still discussing with the firefighter's union how training costs will be shared between department staff and the city and what kind of compensation paramedics will receive.